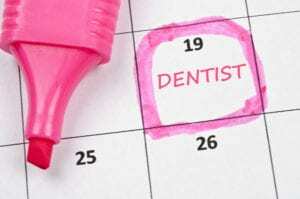 Have you scheduled a dental checkup lately? You need one every six months, according to the American Dental Association and dental professionals. You also need a cleaning, so most people schedule the two together. Unless you have gum disease, dentists often allow cleaning and checkup to be scheduled back to back, for convenience. In most cases, the entire appointment takes about an hour, when no additional procedures are required. At Metropolitan Dental Care, you can expect topnotch care and friendly service. To schedule your dental appointment at either our Denver or Lone Tree location, please fill out our online appointment form or give us a call at 303.534.2626. To stay healthy and deter disease, you need to schedule semi-annual cleanings and checkups, so why not make the most of each appointment? In this blog, we’ll explore why experts recommend you set aside time for not just one, but two visits to the dentist every year. Why not three or four? And don’t miss the checklist below that will help you prepare to maximize and optimize your dental visits. Good oral hygiene is essential for maintaining a healthy and attractive smile. Your daily oral care routine should include brushing teeth twice daily (at least), flossing daily, and rinsing with an antibacterial mouthwash. While daily oral hygiene can help reduce your risk of pesky cavities and keep breath fresh, attending semi-annual dental appointments are just as important. At these visits, the dentist will examine your teeth, gums, and jawbone for existing or potential issues and develop a treatment plan, if needed. Then the hygienist will clean your teeth to remove plaque and tartar, and assess your gums for signs of disease. Neglected oral hygiene can result in tooth decay, gum disease, tooth loss, and costly dental work. Studies show that poor oral health can negatively affect your body and ultimately contribute to serious systemic concerns, such as high blood pressure, diabetes, and heart disease. Taking care of your teeth not only keeps those pearly whites shiny and healthy, but can help keep your body in great shape. Before your appointment, sit down with a pen and paper to make a list of questions or concerns you’d like to discuss with your dentist. It may be helpful to create an “Ask the Dentist” list in the note section of your smartphone, so that as soon as the question pops up, you can conveniently make a note of it. This will eliminate the need to depend on your mind to remember everything and ensure you get the answers you need. A good patient-centric dentist will take the time to listen and offer solutions, as well as resources for more information. At your dental appointment, share with the dentist any oral health changes or general health issues that occurred since your last visit. This may include medical diagnoses, medications, or symptoms. While the dentist can use x-ray technology to detect underlying issues, alerting him or her of any tooth pain, gum bleeding, or abnormalities is helpful. Bring photo identification, your insurance information, wallet, and pertinent medical records with you to your dental appointment. If you wear dentures, retainers, orthodontic aligners, or mouth guards, please bring those with you as well, so the dentist can check for damage and functionality issues. Normal everyday life is busy. Whether you work, go to school, or take care of your household and cart your kids to extracurricular activities, your dental appointment should be convenient. A poorly scheduled dental appointment can cause stress that may ultimately result in a cancellation. If it’s been awhile since you last visited the dentist – today’s a new day. Contact our Denver or Lone Tree dental office to schedule a dental appointment online or call 303.534.2626. We look forward to meeting you and helping you preserve your beautiful smile.